His methods were hucksterish, but B. Max Mehl's advertising vehicles taught countless Americans that some coins can be worth more than the amount stated on them. hen I started collecting coins in 1937, I already knew of B. Max Mehl. His magazine ads had popularized coin collecting as none had before, and kids and adults alike were scouring the loose change, the piggy bank and their local banks in search of the "keepers." In 1904 he published the first of a series of coin price booklets, which he distributed widely by mail. 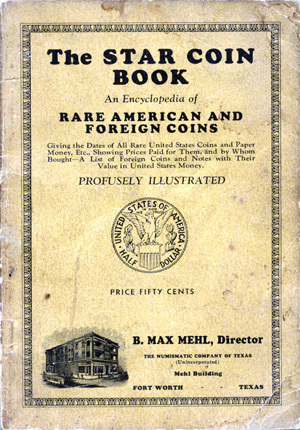 The first series was known as "Catalogue of Fine Selections of Choice United States, Gold, Silver and Copper Coins, Private and Territorial Gold, United States Fractional Currency, etc. etc." In 1906, Mehl had spent $12.50 on an ad in Colliers magazine. Also in 1906 he rented space in an office building at 1309 Main Street. It was reported in several sources that in the early 20th Century, more than half of the incoming mail to Fort Worth went to 1309 Main Street. His draw from his ads was exceptional, as no other dealer was so resourceful at the time. His "Star Rare Coin Book" was a featured seller in his ads at 50 cents a copy. By 1916 he had a new building erected at 1204 W. Magnolia, just south of downtown Fort Worth, and named it the "Max Mehl Building." It still stands today. By 1924, Mehl's annual advertising budget grew to $50,000  an unheard of amount even for major retailers of the time. His book included prices he offered for various rare coins including the $50 for any 1913 Liberty head nickel. He never got one from the ads, but many years later bought one for hundreds of times that amount. Among his well-known customers were Winston Churchill, Franklin D. Roosevelt and Amon Carter. 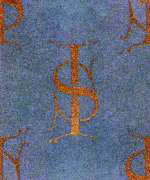 He sold the collection of William Forrester Dunham (1857-1936) in 1941 for $83,364.08  a staggering amount for the time. It included the stars of U.S. coinage: 1804 silver dollar, 1822 $5 gold piece, 1802 half dime, and a broad selection of tokens. The three key coins alone would bring well over $3.5 million today. In his later years, Mehl moved to Southern California and operated his business from Beverly Hills. In a 1966 ad in "The Numismatist," he featured various Washington quarters for 50 cents each and sets of chrome-plated steel cents (1943 P, D, S) for $1.